Minke whale (pronounced /ˈmɪŋki/) or lesser rorqual is a name given to two species of marine mammal belonging to a clade within the suborder of baleen whales. The minke whale was given its official designation by Lacepède in 1804, who described a dwarf form of Balænoptera acuto-rostrata. The name is a partial translation of Norwegian minkehval, possibly after a Norwegian whaler named Meincke, who mistook a northern minke whale for a blue whale. The junior synonyms for B. acutorostrata are B. davidsoni (Cope 1872), B. minimia (Rapp, 1837) and B. rostrata (Fabricius, 1780). There is one synonym for B. bonaerensis - B. huttoni (Gray 1874). Writing in his 1998 classification, Rice recognized two of the subspecies of the common minke whale - B. a. scammoni (Scammon's minke whale) and a further (taxonomically) unnamed subspecies found in the Southern Hemisphere to which he gave the common name the dwarf minke whale (first described by Best, 1986). The minke whales are the second smallest baleen whale; only the pygmy right whale is smaller. Upon reaching sexual maturity (6–8 years of age), males measure an average of 6.9 meters (23 ft) and females 7.4 meters (24 ft) in length, respectively. Estimates of maximum length vary from 9.1 to 10.7 metres (30 to 35 ft) for females and 8.8 to 9.8 metres (29 to 32 ft) for males. Both sexes typically weigh 4–5 tonnes (3.9–4.9 LT; 4.4–5.5 ST) at maturity, and the maximum weight may be as much as 14 tonnes (14 LT; 15 ST). The minke whale is a black/gray color. Common minke whales (Northern Hemisphere variety) are distinguished from other whales by a white band on each flipper. The body is usually black or dark-gray above and white underneath. Minke whales have between 240 and 360 baleen plates on each side of their mouths. Most of the length of the back, including dorsal fin and blowholes, appears at once when the whale surfaces to breathe. Minke whales typically live for 30–50 years; in some cases they may live for up to 60 years. The whale breathes 3-5 times at short intervals before 'deep-diving' for 2–20 minutes. Deep dives are preceded by a pronounced arching of the back. The maximum swimming speed of minkes has been estimated at 38 km/h (24 mph). The gestation period for minke whales is 10 months, and babies measure 2.4 to 2.8 metres (7.9 to 9.2 ft) at birth. The newborns nurse for five months. Breeding peaks during the summer months. Calving is thought to occur every two years. Minke whales are widely distributed throughout the world, commonly found from the poles to the tropics, but they prefer the open sea. Recent genetic studies of Antarctic minke whales indicate the current population is likely to be lower than, or equal to historical levels. According to analyses by Ruegg, et al., the long-term population size of the Antarctic minke whale is estimated at 670,000 individuals . The authors also argue '“The research suggests that direct competition for food is not keeping the [other species] large whale populations from recovering". Final circumpolar estimates from the International Whaling Commission (IWC) IDCR/SOWER population surveys (1978/79-2003/04) were 338,000 — only 39% of the 1985/86-1990/91 surveys. As of January, 2010, The IWC states it is "unable to provide reliable estimates at the present time" and that a "major review is underway by the Scientific Committee." As of 2008, one estimate submitted to the IWC Scientific Committee by the Japanese government researchers suggested that for Southern Hemisphere (CPIII with common Northern Boundaries) is 665,074. In the early 1990s, the IWC Scientific Committee agreed minkes in the Southern Hemisphere numbered 760,000 (CPII), which the Japanese whaling industry currently uses as the (2005) estimate. In 2000, however, the Committee withdrew this advice in light of new survey data suggesting 50% lower population than in the 1980s. The IUCN Red List labels the northern species as Least Concern and the southern as Data Deficient. CITES, on the other hand, lists both species in Appendix I (threatened), with the exception of the west Greenland stock, which is given in Appendix II (trade controls required). The dwarf minke whale (B. acutorostrata subspecies) has no population estimate, and its conservation status is categorized as Data Deficient. Whaling was mentioned in Norwegian written sources as early as the year 800, and hunting minke whales with harpoons was common in the 11th century. In the nineteenth century, they were considered too small to chase, and received their name from a young Norwegian whale-spotter in the crew of Svend Foyn, who harpoooned one, mistaking it for a blue whale and was derided for it. By the end of the 1930s, they were the target of coastal whaling by Brazil, Canada, China, Greenland, Japan, Korea, Norway, and South Africa. Minke whales were not then regularly hunted by the large-scale whaling operations in the Southern Ocean because of their relatively small size. However, by the early 1970s, following the overhunting of larger whales such as the sei, fin, and blue whales, minkes attracted their attention. By 1979, the minke was the only whale caught by Southern Ocean fleets. Hunting continued apace until the general moratorium on whaling began in 1986. Although Norway initially followed the moratorium, they had placed an objection to it with the IWC and resumed a commercial hunt in 1993. The quota for 2006 was set at 1,052 animals, but only 546 was taken. In August 2003, Iceland announced it would start research catches to estimate whether the stocks around the island could sustain hunting. Three years later, in 2006, Iceland resumed commercial whaling. A 2007 analysis of DNA fingerprinting of whale meat estimated South Korean fishermen caught 827 minke between 1999 and 2003. Due to their relative abundance minke whales are often the focus of whale-watching cruises setting sail from, for instance, the Isle of Mull in Scotland, County Cork in Ireland and Húsavík in Iceland. Minke whales are frequently inquisitive and engage in 'human-watching'. In contrast to spectacularly acrobatic humpback whales, minkes do not raise their flukes out of the water when diving and are less likely to breach (jump clear of the sea surface). This, combined with the fact that minkes can stay submerged for as long as twenty minutes has led some whale-watchers to label them 'stinky minkes'. In the northern Great Barrier Reef (Australia), a swim-with-whales tourism industry has developed based on the June/July migration of dwarf minke whales. A limited number of reef tourism operators (based in Port Douglas and Cairns) have been granted permits by the Great Barrier Reef Marine Park Authority to conduct these swims, given strict adherence to a Code of Practice, and that operators report details of all sightings as part of a monitoring program. Scientists from James Cook University and the Museum of Tropical Queensland have worked closely with participating operators and the Authority, researching tourism impacts and implementing management protocols to ensure that these interactions are ecologically sustainable. Minke whales are also occasionally sighted in Pacific waters, in and around the San Juan Islands of Washington State. In 2010, a minke whale swam for two hours with Jodie Nelson who was stand up paddle surfing from Santa Catalina Island to Dana Point in southern California. The whale swam close to her, rolled around repeatedly alongside her, and blew bubbles beneath her board. In November 2007, a minke whale ran aground on a sandbar in the Amazon jungle some 1,600 kilometres (990 mi) from the ocean. Scientists said the whale was 5.5-metre (18 ft) long and weighed about 11 tonnes (12 short tons), and were working to return it to the ocean. The whale beached near Santarém in Pará state, Brazil's Environmental Protection Agency said. Its corpse was discovered the following week "by local people who reported it to the authorities." ^ Arnason, U., Gullberg A. & Widegren, B. (1993). "Cetacean mitochondrial DNA control region: sequences of all extant baleen whales and two sperm whale species". Molecular Biology and Evolution 10 (5): 960–970. PMID 8412655. http://mbe.oxfordjournals.org/cgi/content/abstract/10/5/960. Retrieved 2007-07-13. ^ It had been inaccurately described by the Danish zoologist Johann Christian Fabricius in 1780, who assumed it must be an already described species, assigned his specimen to Balaena rostrata, a name, however, that was already in use. ^ Lacepède, Histoire naturelle des cétacées. (Paris, 1804). ^ Modern orthography makes it Balaenoptera acutitostrata. ^ "Dictionary.com". http://dictionary.reference.com/browse/minke. Retrieved 2007-08-30. ^ Mead, James G.; Brownell, Robert L., Jr. (16 November 2005). "Order Cetacea (pp. 723-743)". In Wilson, Don E., and Reeder, DeeAnn M., eds. Mammal Species of the World: A Taxonomic and Geographic Reference (3rd ed.). Baltimore: Johns Hopkins University Press, 2 vols. (2142 pp.). ISBN 978-0-8018-8221-0. OCLC 62265494. http://www.bucknell.edu/msw3. ^ N. Eriksen, Bente Pakkenberg (January 2007). "Total neocortical cell number in the mysticete brain". Anat. Rec. 290 (1): 83–95. doi:10.1002/ar.20404. PMID 17441201. ^ T.A. Branch (2006). 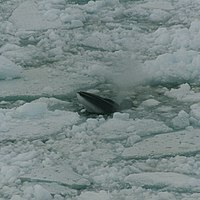 "Abundance estimates for Antarctic minke whales from three completed circumpolar sets of surveys, 1978/79 to 2003/04". IWC SC paper SC/58/IA18: 28. ^ "Whale Population Estimates". http://www.iwcoffice.org/conservation/estimate.htm. Retrieved January, 2010. ^ Hiroshi Okamura and Toshihide Kitakado. "Abundance Estimates of Antarctic Minke Whales from the Historical IDCR/SOWER Survey Data Using the OK Method". http://www.iwcoffice.org/_documents/sci_com/SC60docs/SC-60-IA8.pdf. Retrieved 2010-01-06. ^ Joseph Horwood, Biology and exploitation of the minke whale (CRC Press) 1989:3. ^ Aldhous, Peter (10 May 2007). "High value of whale meat costs minkes in Korea". New Scientist 194 (2603): 10. doi:10.1016/S0262-4079(07)61160-9. http://environment.newscientist.com/article/mg19426034.100-high-value-of-whale-meat-costs-minkes-in-korea.html. ^ Duffy, Gary (17 November 2007). "Whale found deep in Amazon jungle" (web). BBC News, Sao Paulo. http://news.bbc.co.uk/2/hi/americas/7099625.stm. Retrieved 2007-11-17. ^ "Whale lost in Amazon found dead" (web). BBC News. 21 November 2007. http://news.bbc.co.uk/2/hi/americas/7105578.stm. Retrieved 2007-01-01. "Balaenoptera acutorostrata". Integrated Taxonomic Information System. http://www.itis.gov/servlet/SingleRpt/SingleRpt?search_topic=TSN&search_value=180524. Retrieved 18 March 2006. "Balaenoptera bonaerensis". Integrated Taxonomic Information System. http://www.itis.gov/servlet/SingleRpt/SingleRpt?search_topic=TSN&search_value=612592. Retrieved 18 March 2006. Branch, T. A., and D. S. Butterworth. 2001. "Southern Hemisphere minke whales: standardised abundance estimates from the 1978/79 to 1997/98 IDCR/SOWER surveys". Journal of Cetacean Research and Management 3:143-174. "Modes of Production and Minke Whaling: The Case of Iceland", Gísli Pálsson (2000). WhaleGenome.net Minke Whale Genome sequencing project: The world first whale genome. WhaleGenome.org The whale genome org. This page was last modified on 17 August 2013, at 21:51.